Spring is in full swing, and the Richmond region has been privileged to get some great bicycling weather over the past few weeks. We think there could not be a more appropriate time to announce that “Bike Friendly Business” is coming to RVA! The professionals at the League of American Bicyclists (LAB) this month named Richmond’s own Sports Backers the first Bike Friendly Business (BFB) in our region. How do you judge “bike friendliness?” LAB uses criteria from the “5 E’s”: engineering, encouragement, enforcement, education, and evaluation and planning. So businesses and organizations that work to design their offices to accommodate bikes and cyclists, promote and celebrate safe riding, and that consistently strive to improve can get recognition and even some resources as official BFBs. Out of 695 official BFB’s nationally, Virginia boasts the 5th highest number. And the City of Richmond earned Bronze-level recognition as a Bike Frienly Community. So, while the Sports Backers are bringing home the first RVA BFB, we’ve got great company around the state and great momentum to add MORE BFB’s to our region. Want to get your organization certified? LAB has tons of resources. And the deadline to apply for the next class of BFBs is coming up on June 12th. 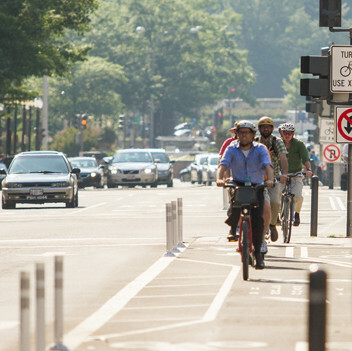 Supporting bike friendly policies gives businesses a competitive edge in so many ways. LAB explains that “bicycling can create more energized, alert and productive employees” and it can decrease healthcare costs, help retain employees, and attract customers. Like a lot workplace wellness programs, LAB’s BFB program helps to drive business success. Locally, there’s another great resource. Charter 2015. In conjunction with Ridefinders and the UCI 2015 Championships, Charter 2015 helps groups here in the Richmond region to educate their employees, beef up their infrastructure, and secure resources. We encourage all Richmond-area businesses to consider applying to both of these programs. If your business is just getting started, both the League of American Bicyclists and Charter 2015 offer resources to help get you rolling! Everything from bike racks, workplace showers, hosting educational bike classes, and more can help your employees start biking to work. Check out Charter 2015 here in RVA.